An aerosol is a gaseous suspension (hanging) into air of solid or liquid particles. The word "aerosol" also refers to the dispenser or package used to change the ingredient inside the container into an aerosol. The aerosol spray can dates back to 1926, when Norwegian inventor Eric Rotheim discovered that a product could be sprayed from an aluminum can that had been injected with gas or liquid to build pressure. In recent years, the basic metal aerosol can has been joined by plastic and glass containers. In 1939 American Julian S. Kahn received a patent for a disposable spray can, but the product remained largely undeveloped. 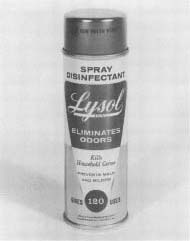 Lyle David Goodhue, credited as the inventor of the spray can, earned a patent for a refillable aerosol spray can in 1941. In 1949 Bronx machine shop proprietor Robert H. Abplanalp developed a cheap, efficient valve, which helped spray cans to come into widespread use. Inside the aerosol spray can is a main ingredient, such as an asthma medication, and a propellant (something that provides thrust or movement). Early propellants were liquified gases such as hydrocarbons, carbon dioxide, or nitrous oxide. The combined ingredients are pressure-sealed, then released by pressing the valve. The propellant Freon became very popular because it is chemically inert (inactive), nonflammable, and nontoxic (nonpoisonous). Aerosol spray is an efficient way to dispense drugs that need to be inhaled in measured doses. For this reason medications for asthma, allergies, and lung conditions such as cystic fibrosis are commonly packaged in aerosol cans. Chlorofluorocarbons (CFCs), including Freon, were used extensively as aerosol propellants. Beginning in the 1970s scientists noticed a massive decrease in the amount of ozone present in the ozone layer, part of the upper atmosphere around the earth that shields the earth from harmful solar radiation. Ozone levels had been constant throughout geological time, but over Antarctica the levels had dropped so low that there appeared to be a "hole" in the ozone layer. As the ozone hole grew larger, scientists began to suspect that CFCs were responsible. CFCs react with chlorine and break down, thereby destroying the ozone layer and allowing more radiation from the sun than is normal to reach the earth. Aerosol products have many uses, from hair care to cleaning and disinfecting. In 1978 the U. S. Government banned the use of certain CFCs, and manufacturers of aerosol products had to find other propellants. Some of the alternative propellants include hydrochlorofluorocarbons (HCFCs), hydrofluorocarbons (HFCs), and carbon dioxide. In 1987 an international treaty known as the Montreal Protocol on Substances that Deplete the Ozone Layer decreed that CFC use should be decreased. Two years later 93 nations agreed to stop producing CFCs entirely and help poorer nations make the transition to other chemistries. Now less than two percent of American-made aerosol cans contain CFCs. Those that do contain CFCs mostly dispense drugs, such as asthma inhalers. The other chemical compounds that have been developed to replace CFCs thus far are more expensive and less versatile. One promising alternative propellant is Polygas, developed by Scottish inventor Bernard D. Frutin. This mixture of carbon dioxide and acetone is reportedly superior to other propellants because it is more environmentally sound, less flammable, and creates higher and more consistent pressure. Hi , I am still concerned about aeorosol cans. How can we be sure the spray cans we use do not contain CFC's? great website! i am still concerned, about aerosol sprays. and would like to know more about it. it seems to me as a good topic. nice website.We can learn more things abort spray throw by this site. this website is pretty nice and you can learn a lot of things from it. I would like to know how aerosol sprays without CFC's can also be harmful to human health. As sprayed in to a hotel room daily for examples?